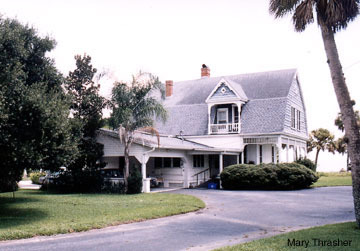 The Judge George Robbins House is the only remaining example of the Dutch Colonial Revival style in Titusville. Robbins bought the lot in 1891 for $1,500. He bought an adjoining lot a year later. Construction began in Oct., 1900 and it was completed in early March, 1901. Robbins served as superintendent of the Mexican Central Railway for two years. He returned to the U.S. and attended law school. Following graduation, he moved to Florida and was admitted to the Bar in 1886. His familiarity with the railroad industry and his prowess as an attorney attracted the attention of railroad mogul, Henry Flagler, who later retained his services. The Judge George Robbins House was selected for the National Register of Historic Places in 1990.